UAD Software v8.0 is available now and includes the long-awaited Apollo Expanded release! Now users of Thunderbolt-equipped Apollo Twin, Apollo DUO, Apollo QUAD, and Apollo 16 audio interfaces can combine up to four Apollos and six total UAD-2 devices — adding I/O and DSP as their studio grows. For example, Apollo owners can now add an Apollo Twin for desktop monitor control, a Unison-enabled guitar input, and additional DSP power! This free update also marks the introduction of Console 2.0 software, giving Thunderbolt-equipped Apollo users dynamic new workflow options, with more than 25 new user-requested features. Console 2.0 will also be coming to for Apollo FireWire (Mac and PC) by Fall 2015! 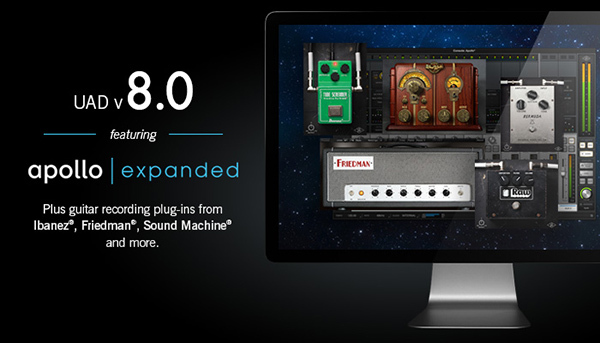 Head over to Universal Audio to download UAD Software v8.0! With one month left in the Apollo Premium Plug-Ins Promo, there isn't a better time to get your first Apollo or expand your current Apollo system. Now through March 31st, customers who purchase any new Apollo Audio Interface will receive some of UA's most coveted UAD plug-ins — from the likes of Neve, EMT, UA, Studer & Manley — for free! It's simple — the more powerful Apollo you buy, the more plug-ins you get. Contact RSPE to schedule a demo and see how Universal Audio​ Apollo interfaces can revolutionize your studio set-up! Hello, My name is Julie Leach. I was working (Night) shift jobs and was wearing myself out trying to support my family. I was looking for a way to make a nice chunk of money so that I could relax a little bit and own my company. I found (Dr. Akugbe) a lottery spells caster that is also specialize in solving others problems e.g Getting your ex-back, Winning Lotteries and Court Cases from a search engine online, I knew it was genuine when I saw his website that he can helps me win big in lottery play. He carry out a jackpot lottery spell cast for me, it was still along shot because I have played the lottery for years and never won. One day on my way to work about 6:30pm at night I stopped to get my coffee and bought $20 worth of lottery tickets, i had a rough night at the fiberglass factory where am a supervisor.Few days later i checked my ticket while on lunch break at MC Donald's, "I didn't believe it" I had to go back to work and get verified from a co-workers and just couldn't believe it. I won the jackpot of ($310.5) million. Three Hundred Ten Million, Five Hundred Thousand dollars! "the state's second-largest winner ever. once i was certain i'd won," i quite immediately i was done! Please Contact Dr. Akugbe at akugbespellcaster@gmail.com (OR) http://akugbespellcaster.wix.com/best-spell-caster. All thanks to Dr. Akugbe.